I saw these SUPER cute reindeer cookies on Pinterest, but they were peanut butter based, and with a peanut butter allergy in Sasha’s class, peanut butter is on the no fly list. So I made nut allergy friendly chocolate chip cookies, with regular pretzels antlers, and a batch with chocolate covered pretzel antlers. 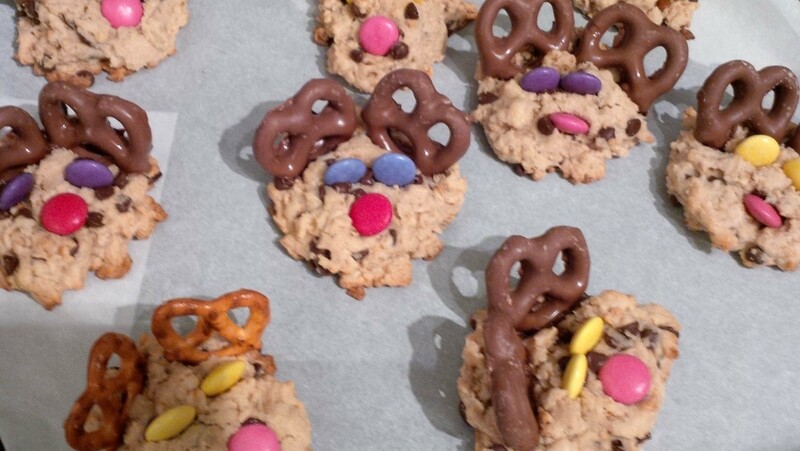 The nose, eyes and antlers can be added to any of your favourite cookie recipes to deal with any of the allergies in your life. A tip…get those antlers, eyes and noses in fast and then pop them in the freezer to harden the chocolate so they stay in place. Enjoy.